Happy Imbolc! Today, February 2 is the pagan holiday that marks the halfway point between Winter Solstice and Spring Equinox. It's Celtic name is St. Brigid's Day and it's Christian name is Candlemas. 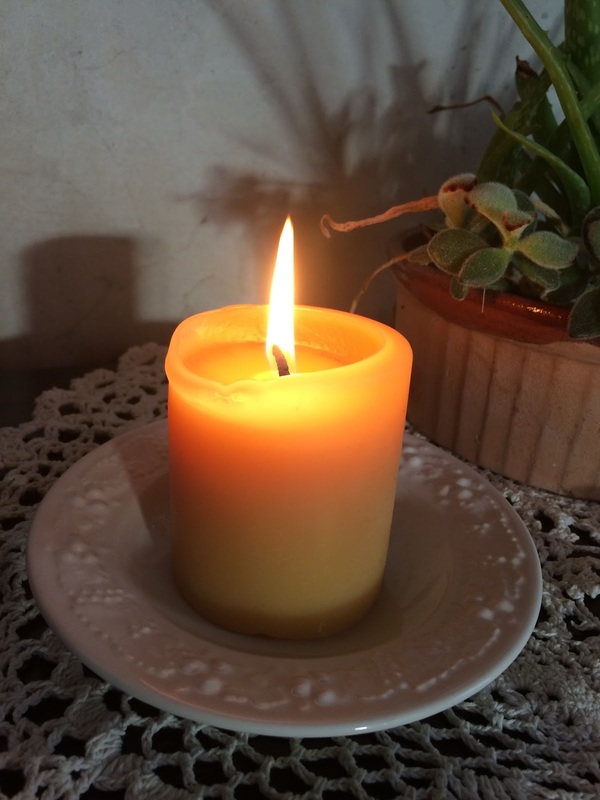 Candle lighting is central to the celebration of this day as we celebrate the return of the sun and the lengthening days. Here at Honey Pie Hives & Herbals we are pleased to introduce an exciting new beeswax candle - a Treasure Candle! Hidden inside a pillar candle are gem stones which can only be released by burning the candle. Our first variety is a Love candle which contains three gem stones chosen for their affinity with the heart. Light the candle with the intent to welcome love into your heart. Once you have extracted the gems you can make your own love charm with them as they are beads. Look for the Treasure Candles at the Green Barns farmers' market in Toronto and at upcoming Seedy Saturdays in Ottawa, Kingston and Picton. It's also the time of year to sign up for our Beekeeping Workshops. This hands on class is for beginners. Gavin takes you through the season with a full day class once a month from April to September. If you've ever dreamed of keeping bees this is a great way to learn. 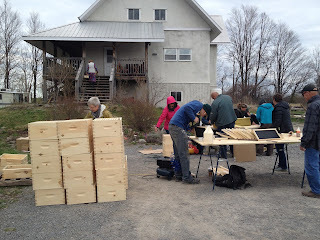 The course covers building your hive (as seen in this photo), installing your bees, maintaining the hive, harvesting honey, winterizing the hive and more. 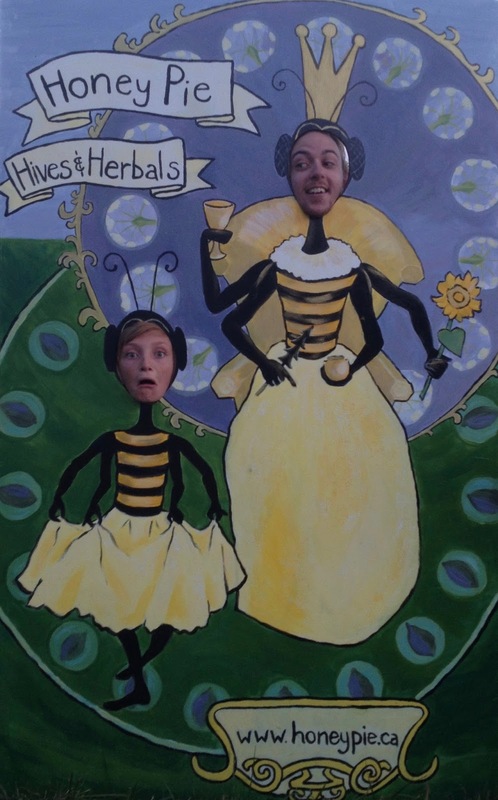 There's plenty of opportunity for asking questions and sharing stories with your fellow bee lovers. In the photo below Gavin shows the class around inside a beehive to learn to identify the three different bees in the hive - the queen, the drones and the workers. 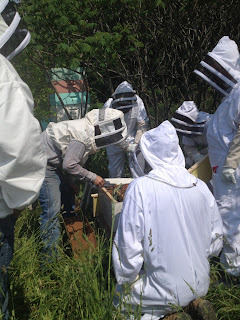 Everyone goes home to inspect their hive and see if they can find the queen. One of my projects last year was to paint this photo board with a fantastical version of the queen bee and one of the workers. People love posing and getting their photo taken outside our farm store. I think it would be fun to paint a few more of these. Wouldn't it be great to have them around Prince Edward County at different tourist attractions? If you'd like me to paint one for you let me know - winter is the best time for projects like this. We were very honored last fall to receive a regional Premier's Award for Agri-Food Innovation. This was for the technique we use for making our mead which reclaims honey that would otherwise be wasted. It was so interesting to discover all the other recipients of the award. 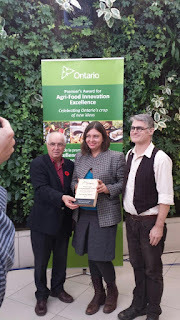 Our friends at Pyramid Ferments got their second Premier's Award for their delicious gut shots. Congratulations Alex and Jenna! The top prize went to a shrimp farm in Campbellford, Ontario! How amazing to be able to get local shrimp. 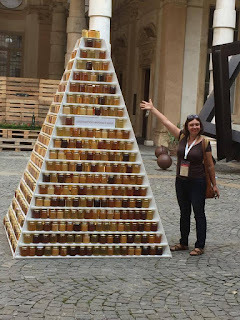 The highlight of my year was the opportunity to go to Turin, Italy as the delegate of our local chapter of Slow Food for their event Terra Madre. Much of this event is an open air market where food producers from around the world are sampling their wares. I worked a couple of shifts in the Canada booth where we were sampling salmon from a sustainable native fishery in BC, raw milk cheese from Quebec, and maple syrup from Nova Scotia. The booths from Italy are the biggest section of the event. There were long rows of hazelnut producers, cheese makers and of course countless places to sample wine. 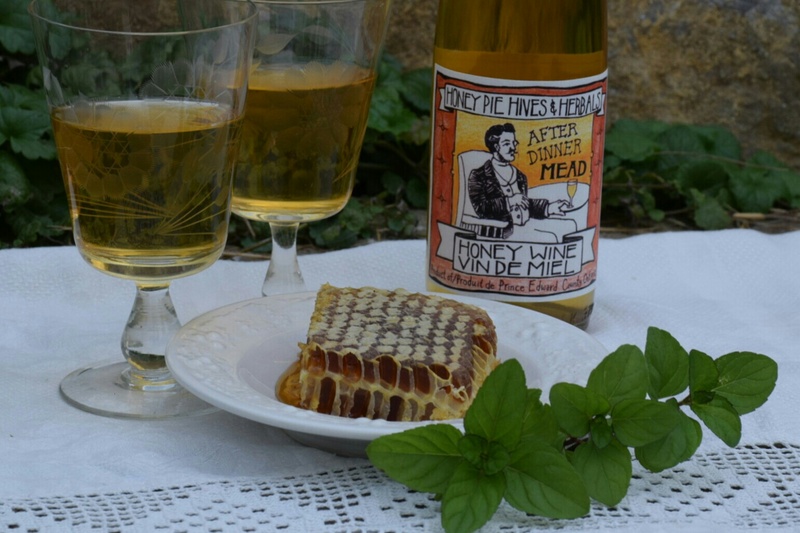 I took some of our mead to be sampled in a workshop on mead. There were three Italian meads, a Japanese mead and ours. It was all conducted in Italian so I was a bit lost but I can tell you that our mead was most similar to the Japanese mead which was light and delicate in flavour. The Italian meads were all heavy and sweet. One of them, from Sicily was made by boiling the honey down with oranges. As we don't cook our honey the flavour was entirely different. 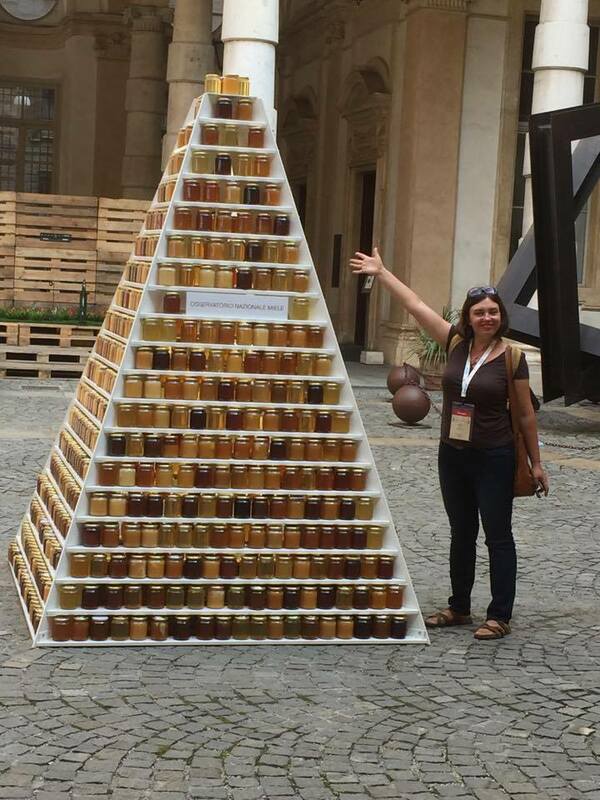 In the picture I'm next to a pyramid of honey from all over Italy. Slow Food promotes the preservation of food culture and small farming. It was inspiring to meet so many people from all over the world who care about the things that I care about and work in the same industry. I met a young lawyer from Argentina who is working on the international tribunal against Monsanto to hold them responsible for human rights violations, crimes against humanity and ecocide. If you are feeling overwhelmed by all the negativity in the world, I want you to know that there are people all over the planet doing wonderful positive work and you can be a part of it!